The New York City Council voted on Wednesday to approve 80 Flatbush, a five-building mixed-use development planned for Downtown Brooklyn, Curbed NY reported. The approval comes after negotiations last week between Alloy Development and Council Member Stephen Levin, who represents the area, which led to a shorter, less-dense complex. After the developers agreed to cut the height of two buildings, one from 986 feet to 840 feet and another from 560 to 510 feet, the Council’s subcommittee on zoning voted in favor of the project. 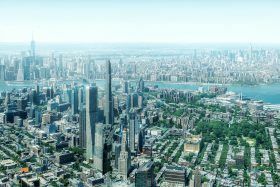 The New York City Council’s subcommittee on zoning voted unanimously Thursday to approve the rezoning application that allows for the construction of 80 Flatbush, a five-building complex planned for Downtown Brooklyn. 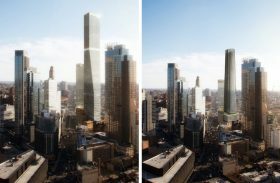 Following negotiations between Alloy Development and Council Member Stephen Levin, the developers agreed to cut the height of two buildings, one from 986 to 840 feet and another from 560 to 510 feet (h/t Brooklyn Paper). New renderings reveal not only smaller buildings but an updated design as well. With this key approval, the project will most likely get support from the full City Council followed by Mayor Bill de Blasio. 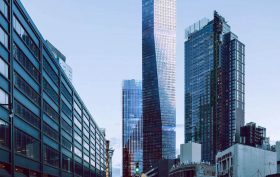 Alloy Development announced plans to build a pair of towers at 80 Flatbush Avenue, a 61,000-square-foot parcel of land between Flatbush Avenue, Schermerhorn Street, Third Avenue and State Street. The developer–who, with the Department of Education, owns the land–has been selected by the city’s Educational Construction Fund to build the mixed-use complex as part of the redevelopment of the Khalil Gibran International Academy, which will move into one of the two new school buildings that will be part of the project. The second of the two will be a 350-seat elementary school. The project will also offer 900 apartments (200 of which will be affordable), a 15,000-square-foot cultural facility, 200,000 square feet of office space and 40,000 square feet of retail space.